Most areas topped out in the upper 80's yesterday although isolated pockets reached 90. 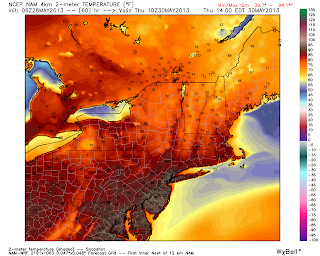 Today the majority of the region will reach 90. A few pop up showers/thunderstorms are possible, but odds are very low. 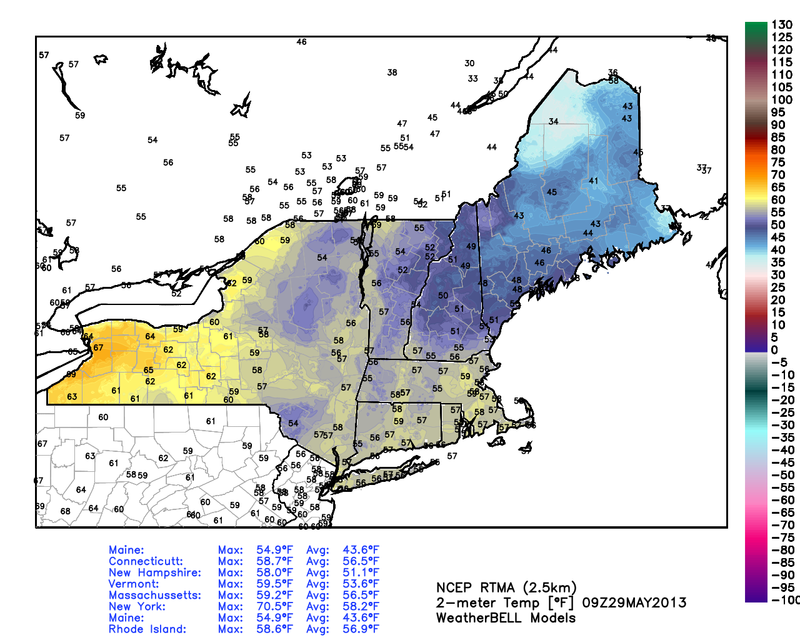 My best bet is NW CT and the Berkshires. 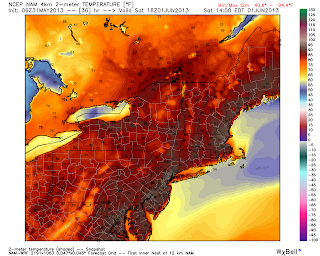 There is no relief on Saturday as temperatures region wide will be near 90. Sunday a front begins to approach from the west but will not quite reach New England until Monday. 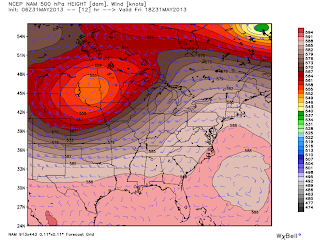 At the 500 mb level we have a strong upper level low pressure center over the Dakota's and a sharp ride in the east. 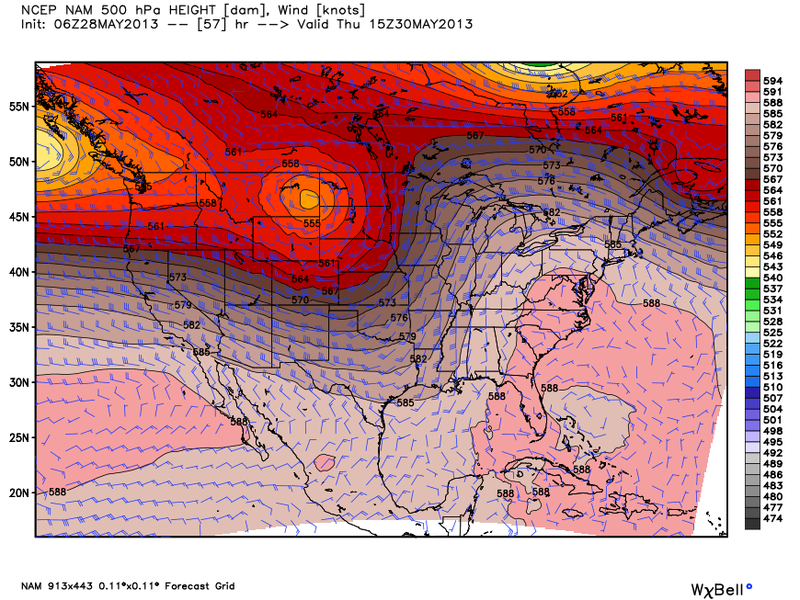 That sets up 90 degree weather in New England an a strong thunderstorm threat in the heartland. Tonight low temperatures drop only into the upper 60's. 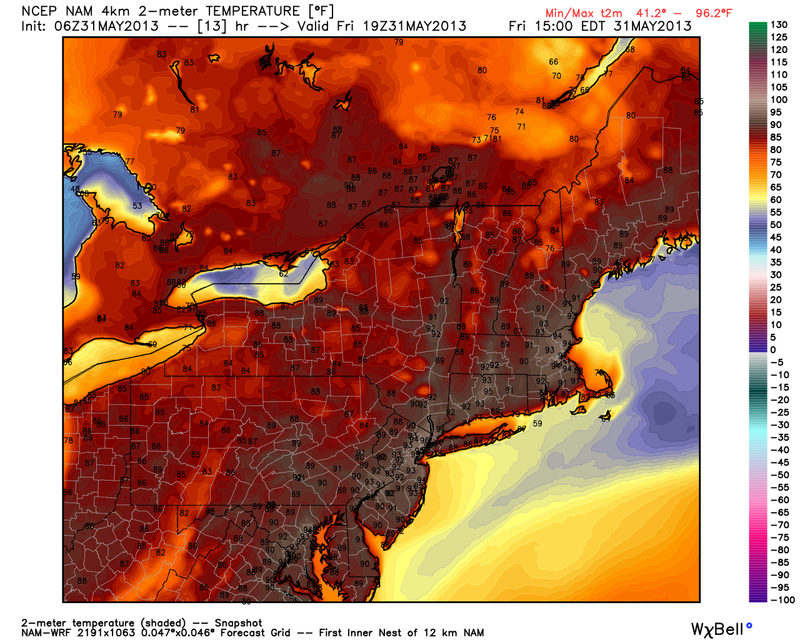 Some urban areas may not drop below 70. Tomorrow morning a warm boundary will exist in the Northern portion of New England but high pressure will still be in control along the east coast. 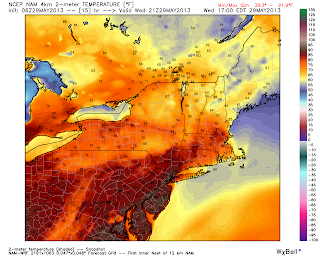 This front will bring relief from the heat. I'll watch it, have a good Friday. A pop up shower or thunderstorm will be possible today. There isn't a true trigger for thunderstorms like a front or a trough but with an air mass like this it will not be impossible to see something fire. We can repeat this forecast Friday and Saturday. 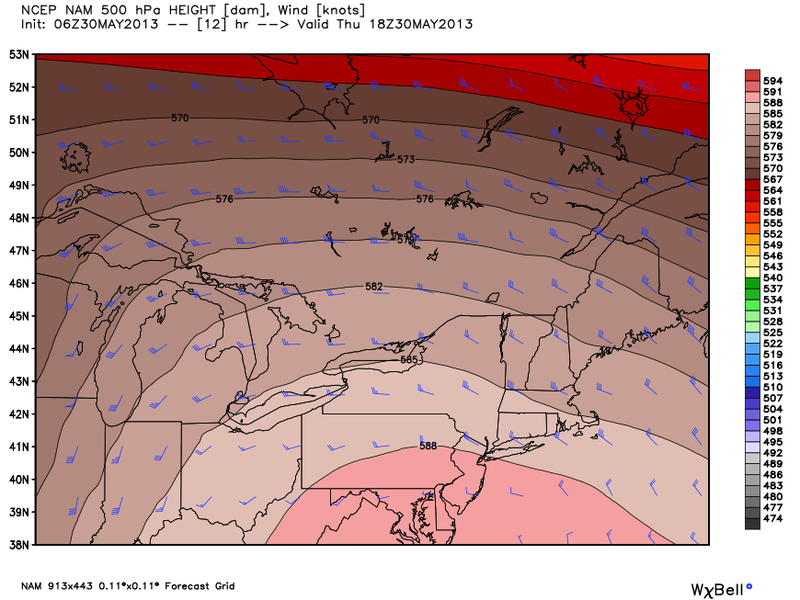 Sunday looks dry but will have to monitor the speed of an incoming cold front Sunday/Monday. Have a good day stay hydrated. The Storm Prediction Center in Norman, Oklahoma has issued a severe thunderstorm watch for Northeast CT, SW NH, and all of MA from Worcester County West. A strong line of thunderstorms is moving through upstate New York. Many locations are under severe thunderstorms warnings and several are under tornado warnings. Tornado warnings are in red, severe thunderstorm warnings in yellow. This is a dangerous line of thunderstorms that should hold together as they march into Western and Central MA, and NE CT.
You should take in anything that may blow away. Afternoon short range models continue to indicate a the potential for a squall line this evening. Squall lines often produce dangerous lightning and damaging winds followed by heavy rain. Surface based available energy is low at the moment, but with the sun shining destabilization should increase in New England through the afternoon. Western MA and CT will see storms fire first around 4-5 PM. Central MA and RI will be okay until at least 6 PM. There is a small chance a rogue super-cell could outrace the main line before hand so keep an eye to the sky. Remember, lightning travels the path of least resistance. If you hear thunder you can be struck by lightning. A warm front is moving northeast toward New England and ahead of this boundary moderate rainfall is falling in portions of Southern New England. This afternoon the boundary lifts into Northern New England and if enough sun breaks out then severe thunderstorms will break out. 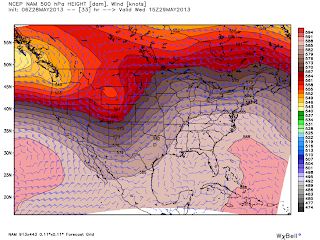 A ridge is building in the east so temperatures will be on the rise for the next several days. The main threat with any thunderstorms will be damaging wind. A "severe" wind is one in excess of 58 mph. The threat for thunderstorms appears to be between 4-8 PM tonight. Any thunderstorms will have frequent lightning and heavy downpours. Tonight lows drop into the mid 60's so it will be a mild night. Summer sends its first true wave into New England tomorrow. 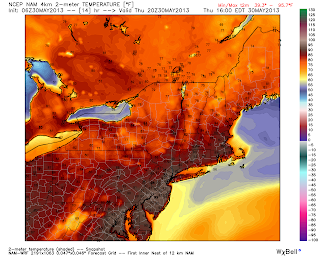 Most see high temps in the upper 80's/low 90's. 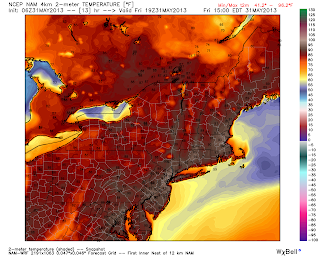 Friday looks to be even warmer, low to mid 90's. Have a good one, I will be out this afternoon but will try to update as needed. After a pleasant and dry Tuesday a warm front will lift through Southern New England tonight and Wednesday. There will be a threat of showers and thunderstorms tonight and the potential for some severe weather tomorrow. By Thursday high temperatures will be soaring into the upper 80's/low 90's and these temperatures will last through the weekend. On Thursday the ridge will build into the east. 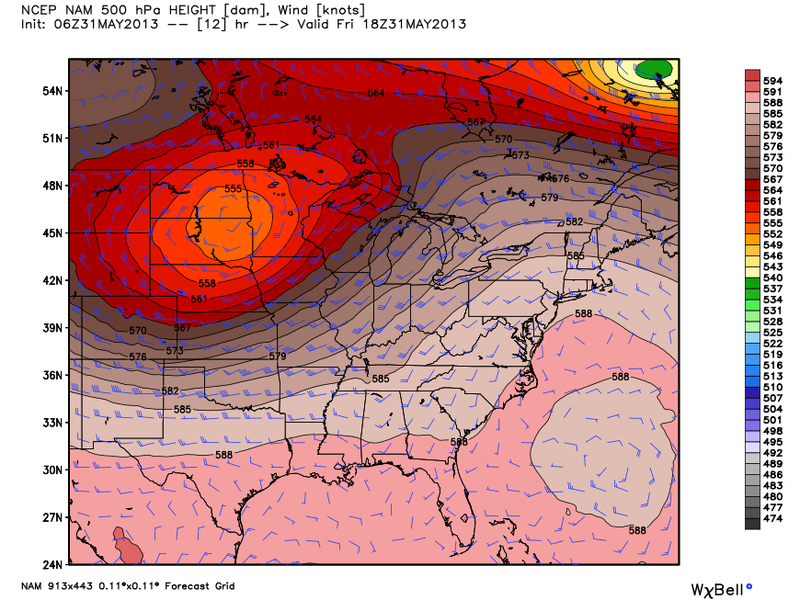 A trough digs into the Plains which is looking like a classic tornado outbreak for those folks.